My friend Andrew (we call him “Quade”) and I decided to fly to Australia to see our great friend Johnny. Quade lives in the UK and Johnny lives in Sydney, Australia — but we all went to university together in the UK. We hadn’t all hung out since my wedding back in 2014, so it was time to make a trip like this happen — and of course, it presented the perfect excuse to book an extremely exciting method of getting to Sydney! You can imagine the answer, and how quickly he gave it! 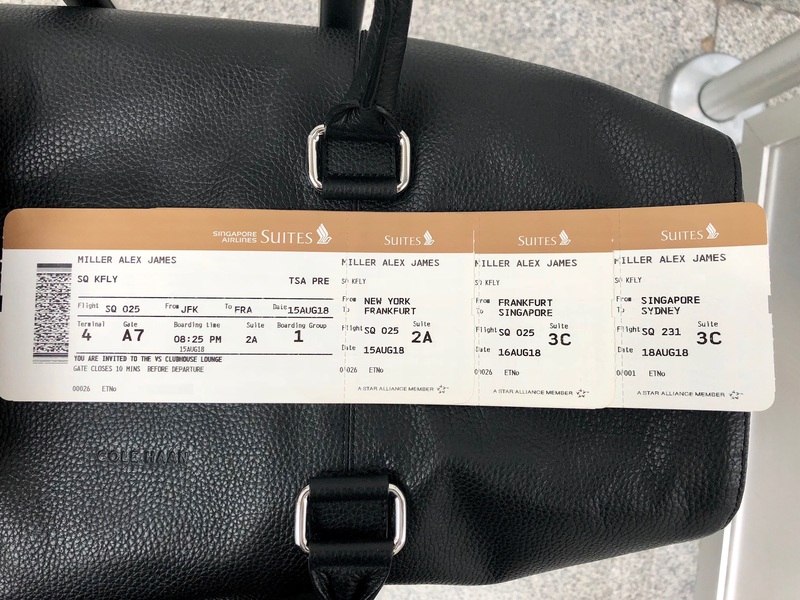 Since I live in the U.S., I was able to book my ticket from JFK > FRA > SIN > SYD on Singapore Suites at a cost of 152,000 Singapore KrisFlyer miles and ~$77 in taxes and fees. 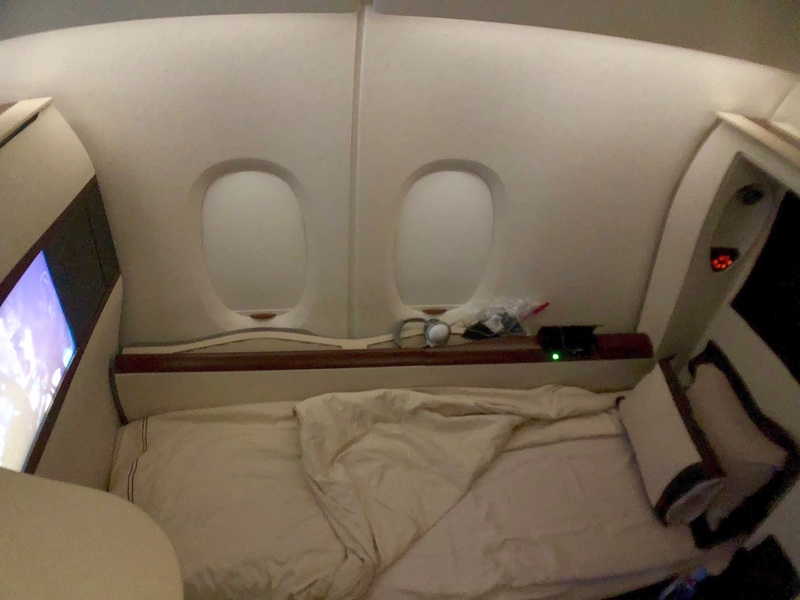 This is the best value for redeeming SQ miles for Suites, and interestingly enough the JFK > FRA leg works out to only cost an extra 4,000 miles vs. just booking FRA > SIN > SYD (see more details here). Given that, I tried to work it out so Quade could fly from the UK to JFK to maximize points, (!) but for several (logical) reasons we decided to just meet in Frankfurt. This was going to be one hell of a trip! Quade’s ticket ended up costing 148,000 KrisFlyer miles and ~$77 in taxes and fees. 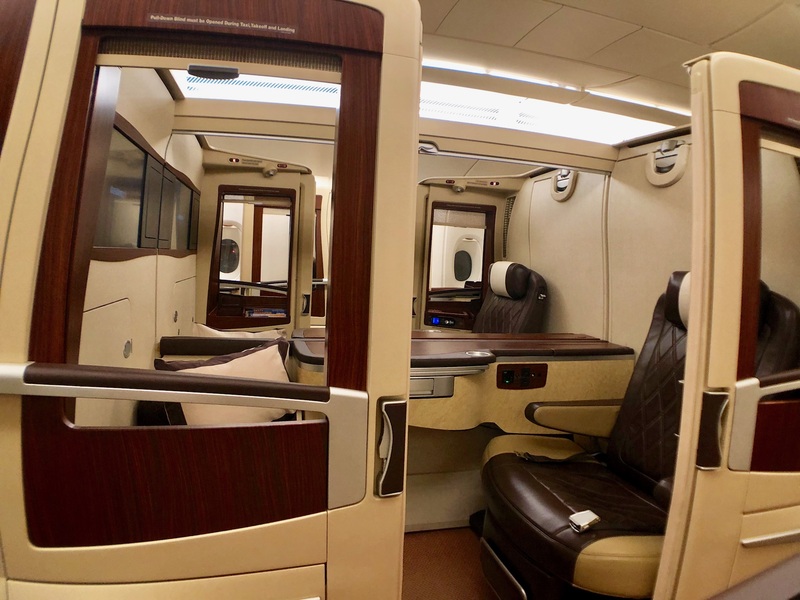 Hot Tip: For a complete list of SQ routes to/from the United States, check out our article: The Definitive Guide to Singapore Airlines U.S. Routes [Plane Types & Seat Options]. 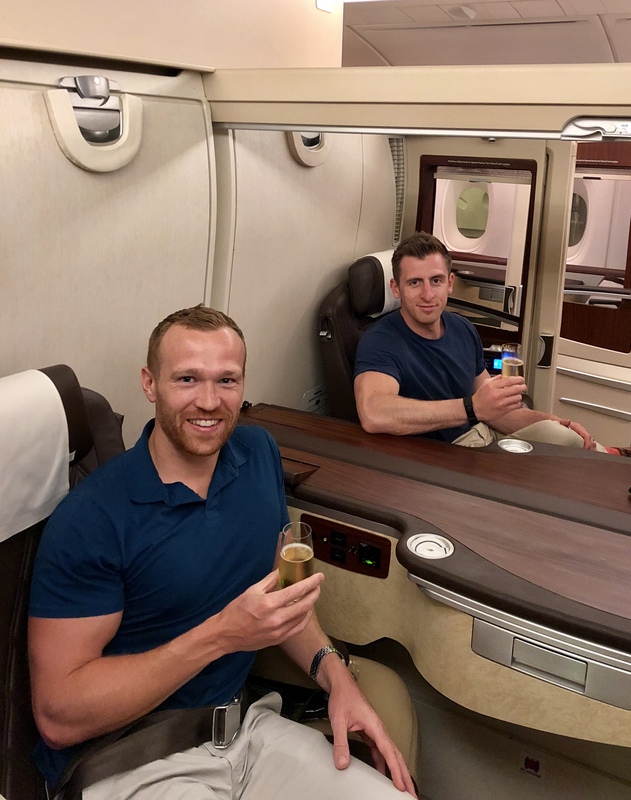 How did I earn all those Singapore KrisFlyer miles for both of us? I earned Chase Ultimate Rewards points and then transferred those Chase points over to my Singapore Airlines KrisFlyer account (which takes 2 mins to setup) at a ratio of 1:1. Bottom Line: I booked this trip by earning Chase Ultimate Rewards points which can be done by signing up and using the Chase Sapphire Preferred® Card. Once you have enough points, you’ll transfer those points directly to Singapore Airlines to make the booking. After finding award space, I booked it all online without having to call anyone. If you’re a business owner, you can earn the same Chase points by using the Ink Business Preferred℠ Credit Card — which is one of my favorite business cards. 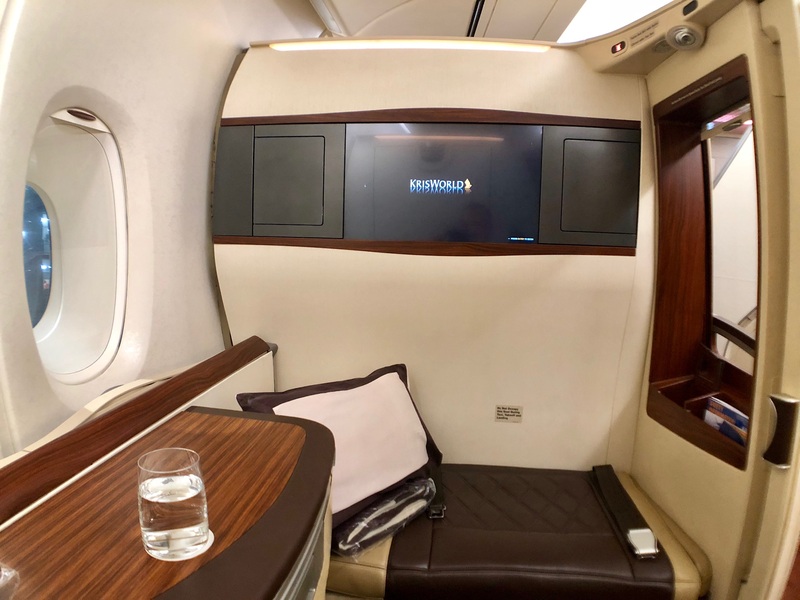 Singapore Airlines is also a transfer partner of American Express, Marriott and Citi giving you so many ways to earn enough points for a trip like this! My preferred method though is to collect Chase points as they are very easy to earn. I flew from Austin to JFK on American Airlines (just simple economy, nothing fancy here) and arrived in New York about 2pm. I was able to fit all my luggage into just a carry-on and personal item for the 2-week trip — whew! There was a method to my madness: I knew I had a lot of flights ahead of me, and lugging around a checked bag was only going to slow me down. Departure time for the flight from JFK to Frankfurt was 8:55. Fortunately, Singapore Airlines opens up their check-in desks 6 hours before departure at JFK. So I only had to wait 30-40 minutes; since I was the first person to check-in, I got my ticket nice and quickly. 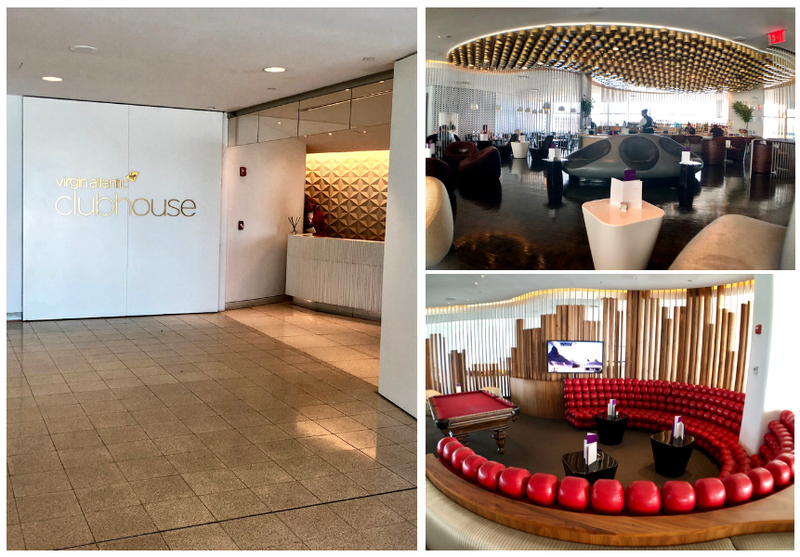 As for security, I’m signed up to TSA PreCheck (thanks to a benefit of the Platinum Card® from American Express), so I sped through and was at the Virgin Atlantic Clubhouse lounge before I knew it. 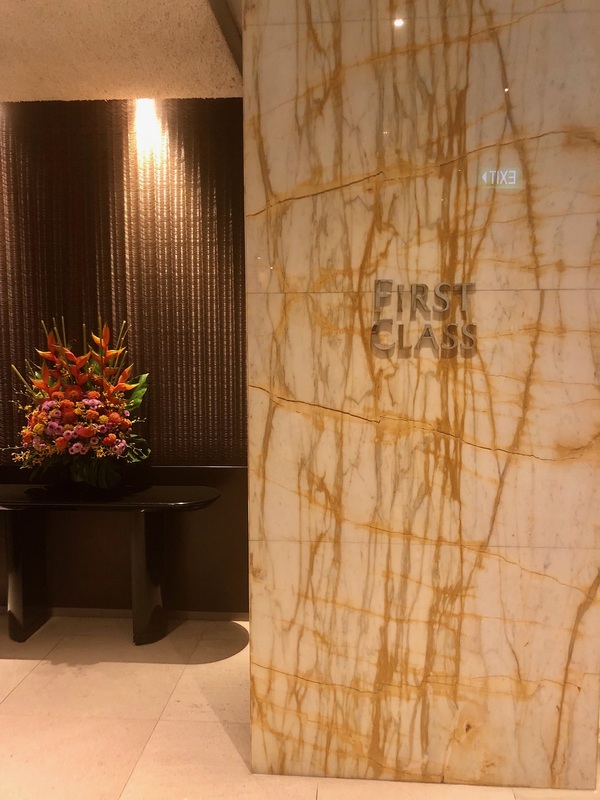 This is where Singapore Airlines business and first passengers can unwind before their flight, since Singapore doesn’t have their own dedicated lounge at JFK. When I arrived at the lounge about 3:15pm, it was extremely quiet, with just myself and a few other passengers relaxing there. I love the bar at this lounge, so that’s where I posted up for most of my time, enjoying a range of snacks, a delicious chicken curry dish, and of course a few beverages! By the way, Berst was a wonderful barman — if you’re lucky enough to be served by him, you’re guaranteed to be well looked after! All in all, this lounge is certainly one of my favorites. There’s an energetic vibe to it, the food is delicious, the staff are fun, and there’s a snooker table as well as a salon there! What more could you need?? 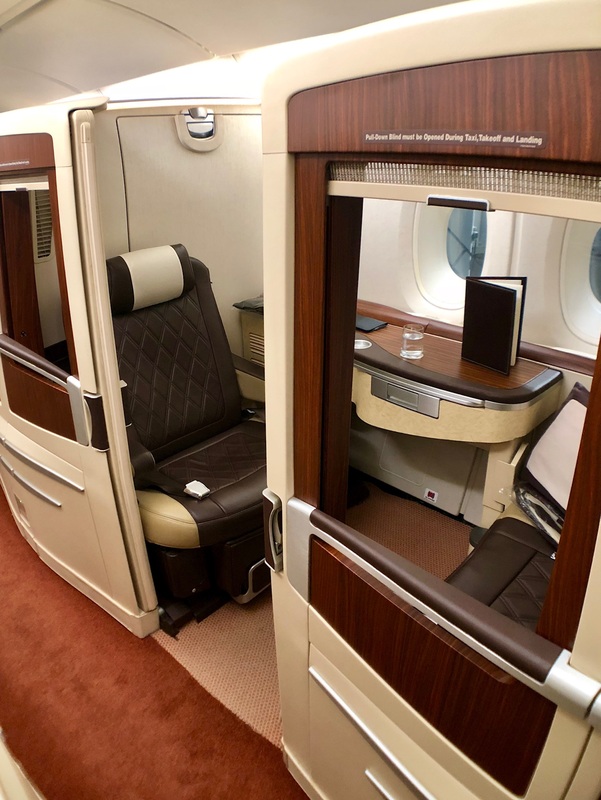 As we’ve mentioned before, the Singapore Suites cabin is very unique and still looks pretty “current” for a product that was first launched back in October 2007! Originally, I had booked online for Quade and me to sit next to each other in the middle seats from Frankfurt to Singapore (3C, 3D). But because my ticket included the whole journey of JFK > FRA > SIN, I couldn’t specify a different seat from JFK > FRA online. Seeing as I was traveling on my own, I wanted to get a nice window seat, so I made the change at the desk to seat 2A for this first leg. Below are pictures of seat 2A before I got moved (more on that below!). I’d definitely recommend this for those who are traveling alone, as it’s positioned perfectly between the back and the front of the plane. In my opinion, the seats at the very front are kind of in a “dark corner” of the cabin, and you seem to lose some of the atmosphere. You’ll notice that I’m drinking water (shock!) 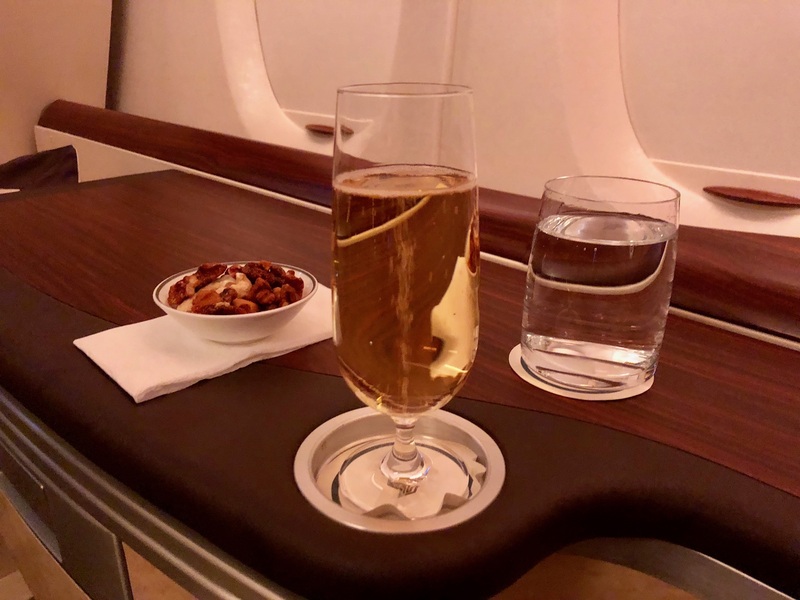 because Singapore Airlines is unable to serve alcoholic beverages while on the ground in the U.S. — they have to wait until the plane has taken off. This was probably a good thing after being in the lounge for a while! There are no overhead bins, but there’s still plenty of space to store your hand luggage below the footrest area in front of you, which you can see below. Now, I was actually moved to seat 2F after we were in the air for about 30 minutes or so. This was due to my entertainment system not working, despite a couple of reset attempts. What was strange was that the staff said they had reset it, but it never actually did — and we were kind of going around in circles about it. There were only 3 other passengers traveling in Suites Class (out of 12 available seats), so I suggested simply moving to seat 2F (on the right side of the cabin in parallel to 2A). Basically, this was zero issue for me and seemed like an easy enough fix. 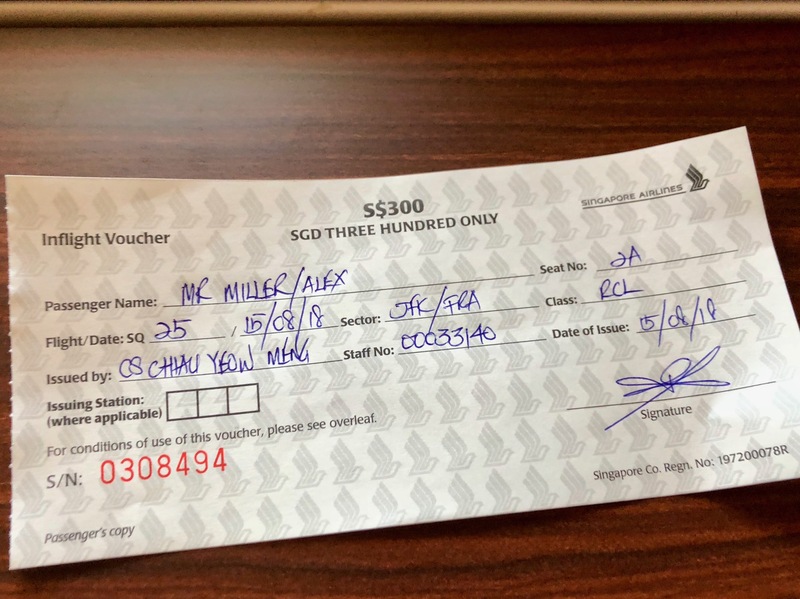 That being said, after I settled into my new seat in 2F, the flight attendant came over to my seat with a $300 SGD voucher as an apology for the issues with the entertainment system and having to move seats! I tried to convince them that this was totally unnecessary, but he insisted — I was completely blown away by how they handled this. It’s just one example of many why I think Singapore Airlines has the best customer service in the sky, by FAR. The $300 SGD voucher could be spent in their KRISSHOP (which has thousands of products), and it had to be used within a year. 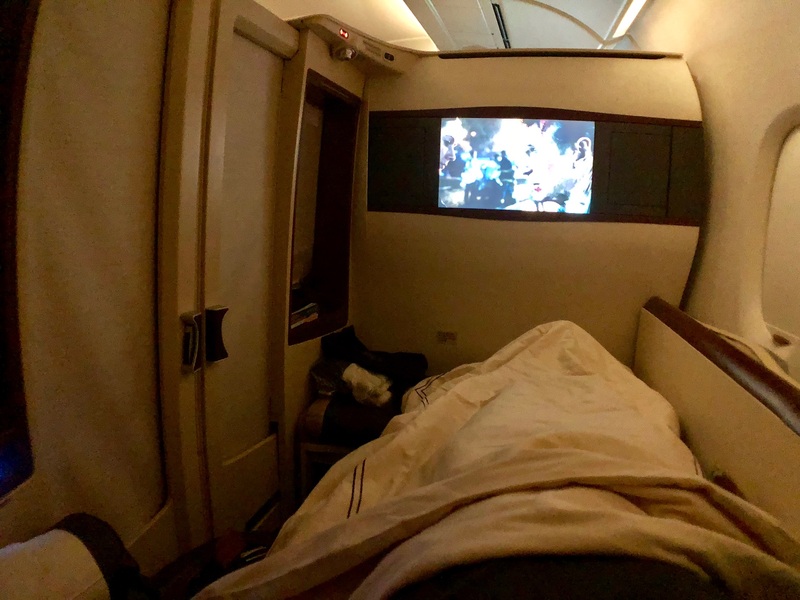 After realizing the $300 SGD was actually 3x the amount I paid in taxes and carrier fees for the flights to Sydney, I was pretty stunned and completely forgot to take pictures of 2F (apart from when the bed was turned down). Falling asleep on this bed is about as challenging as drinking a glass of their Dom Perignon! 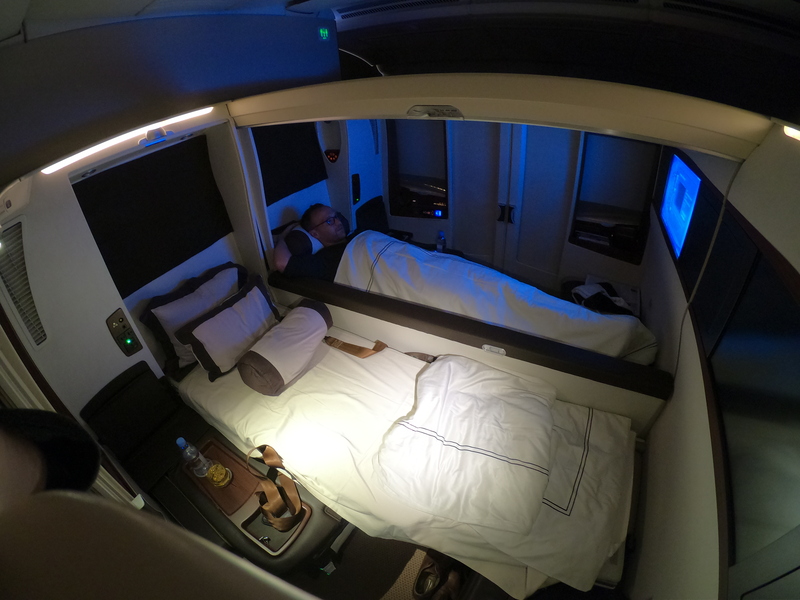 It’s one of my favorite beds in the sky — an opinion shared by many others who have been lucky enough to experience it. 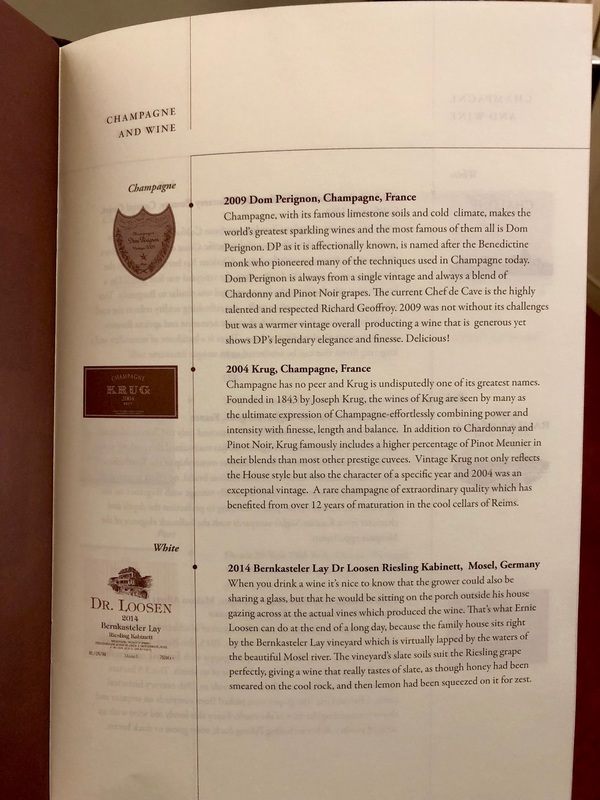 Singapore has some of the best champagne in the world on offer, leaving passengers to decide between Dom Perignon or Krug! First up was a glass of Dom Perignon, some delicious mixed nuts, and the (not-so-popular) water as a third wheel. It was exciting to receive one of the new amenity kits from Lalique, which were not yet issued when we flew Suites in October 2017. There’s even a candle included, which is unique for an airline’s amenity kit! It shows Singapore is thinking outside of the box. As I see it, they’re planning for you to continue remembering the experience after returning home, since it’s obvious this product can’t be used at 40,000 feet! The meal service was outstanding as always with staff providing everything I could need (and more) during the 5-course experience. I’ve often said the cabin crew in Singapore first are like ninjas: they know exactly what you want before you even know you want it! 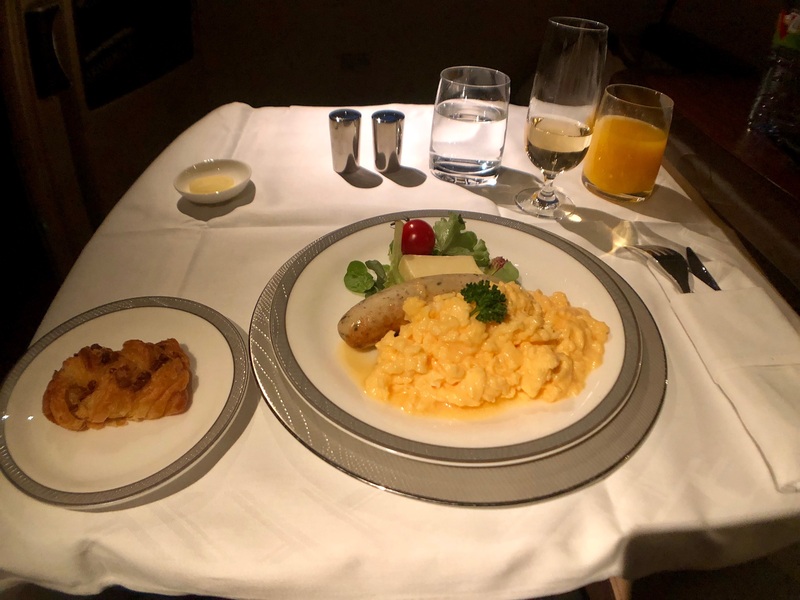 The last time I flew Singapore Suites, I had the Lobster Thermidor, which is exquisite. Since I had already pre-ordered lobster to have with Quade from FRA > SIN (and also on the new Singapore Suites when I flew back from Sydney! ), on this leg I decided to try the lamb instead. If you’re a fan of lamb, then I highly recommend this dish. It was delicious and cooked to perfection. 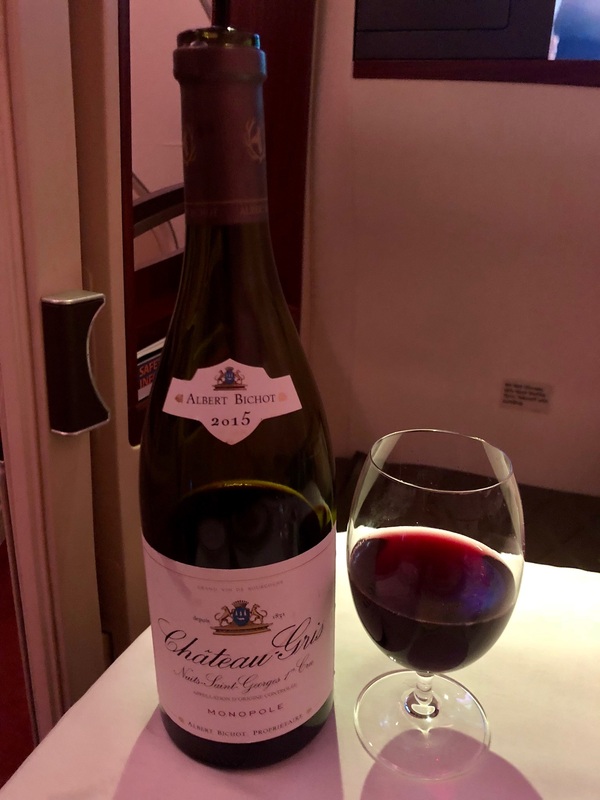 Of course, red wine pairs extremely well with lamb, and I enjoyed a couple glasses of this delight! After getting a few hours sleep, I was awoken served a light and refreshing breakfast. 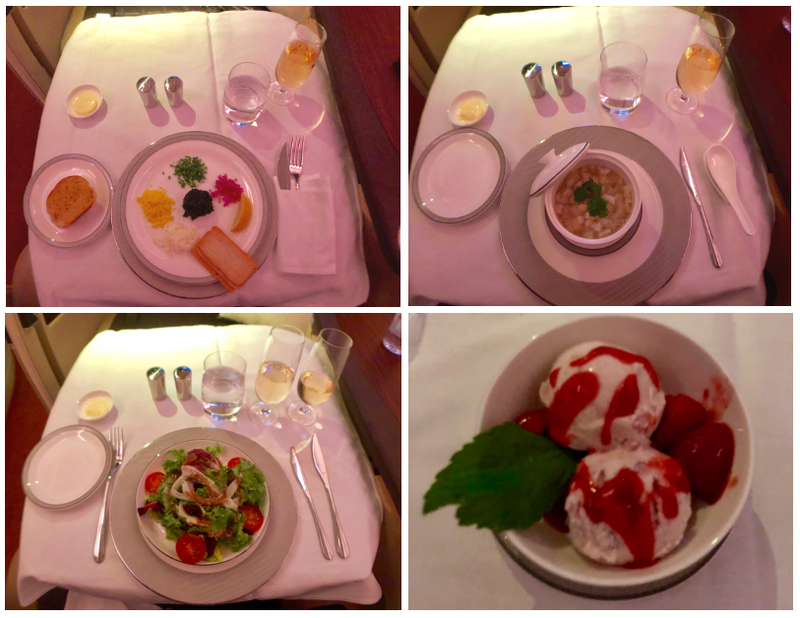 With a long 12-13 hour flight ahead of me (Frankfurt to Singapore), this meal was no time to stuff myself! Even though there isn’t a plane switch, Singapore does perform a thorough clean and a changeover of the cabin crew. So they request that you take your belongings and luggage with you for the ~2-hour layover in Frankfurt. I disembarked the plane and was escorted to the Senator Business Class lounge, which was a 60-second walk from our gate — now that’s handy! When I got into the lounge at about 10am local time, it was busy! I didn’t see Quade initially, so I did a full lap of the lounge and caught him the second time around. 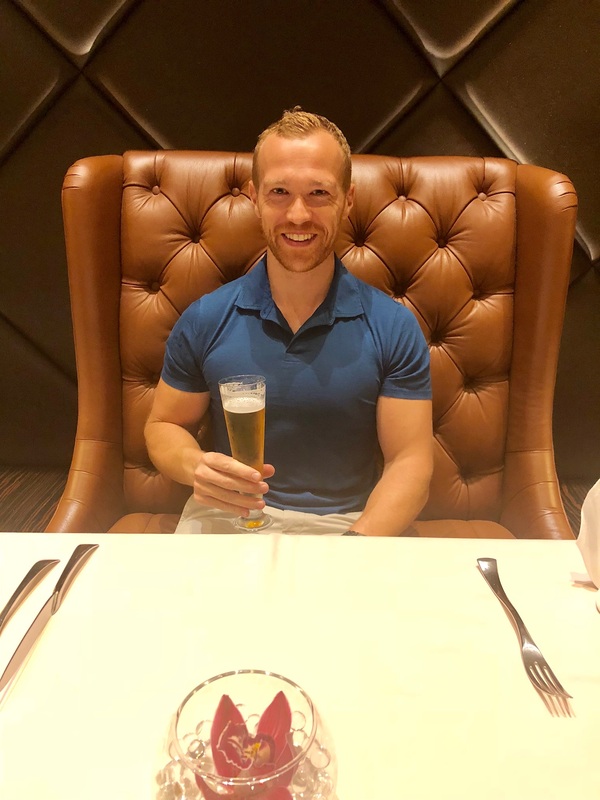 It was so good to see him — before we knew it, we had a glass of champagne in hand and were quickly catching up and chatting about the exciting trip ahead! The lounge is large; it must be able to fit hundreds of people. There are some nice seats by the windows that face the runways, so it’s a great lounge for aviation enthusiasts as there’s lots of plane watching! There was easily an hour to go before boarding and so I took the opportunity to freshen up for the long 12.5-hour flight ahead by having a shower in the lounge. The facilities were great and spacious enough with everything I needed. We were SO excited to board this flight together, and I couldn’t wait to see Quade’s face when getting on the plane. 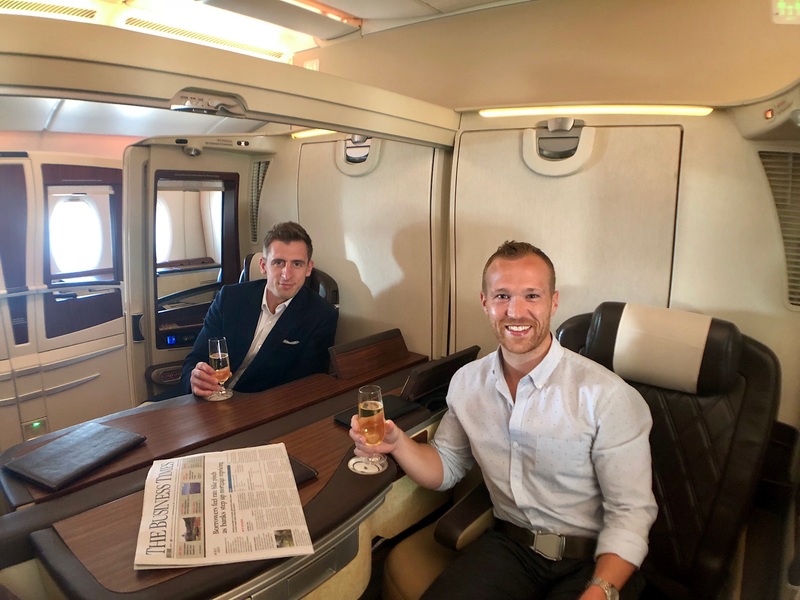 He had flown business class internationally on British Airways a few times before, but of course SQ is a massive step-up from that. Our seats for the 13-hour trip from Frankfurt to Singapore were 3C and 3D. These are the same seats that Erin and I had when we last flew to Singapore in Suites! After being warmly greeted by 4 (!) 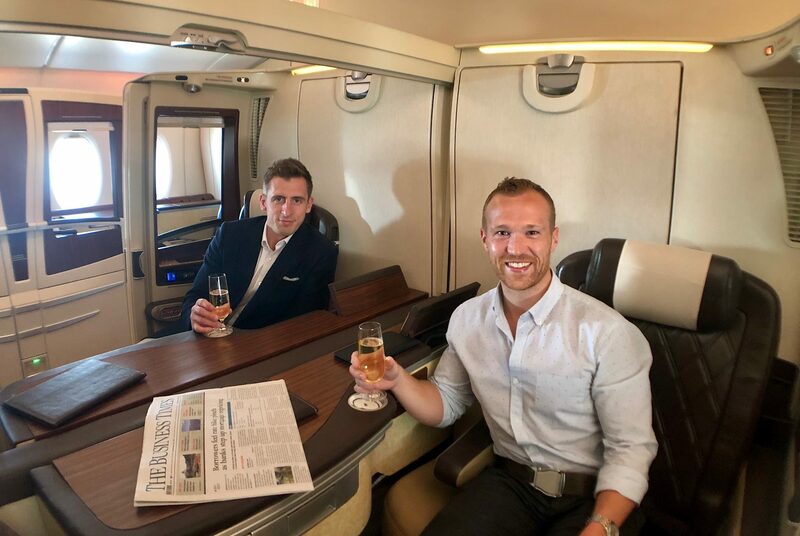 members of the cabin crew, we took our seats and were served a glass of bubbly in record time. 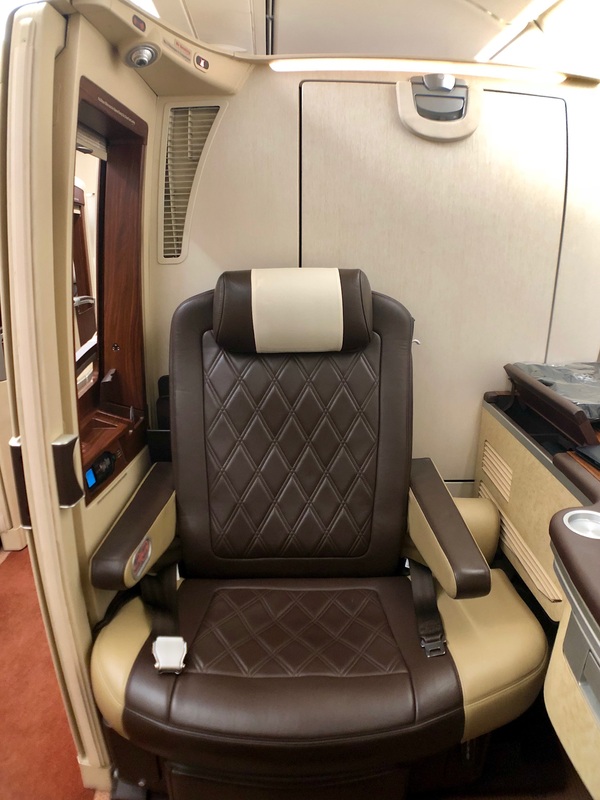 There’s just SO much space in Singapore Suites, and these seats are a perfect choice for those who are traveling together. 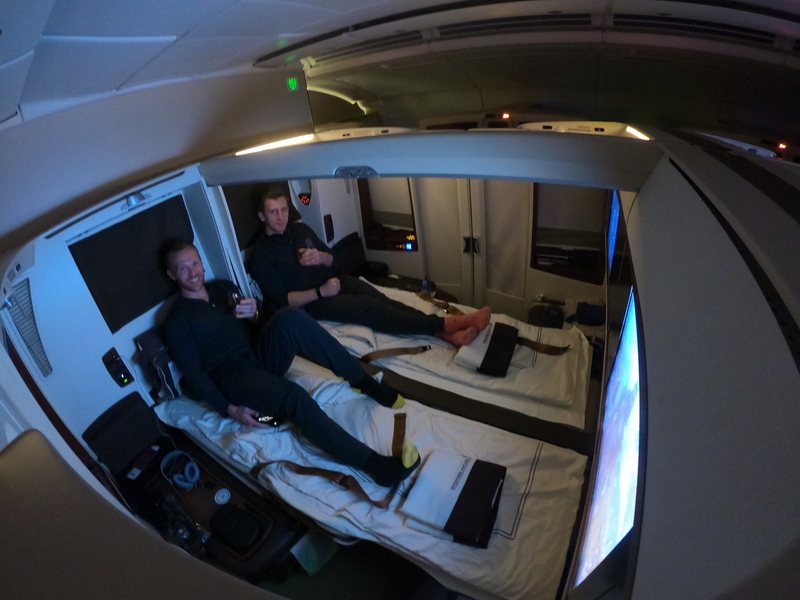 Quade and I actually ended up chatting and catching up for the first 6-7 hours of the flight, and only then requested for the beds to be made up by the crew. When the beds are turned down separately (i.e., not a double), you’ll notice you’re still able to easily talk to one another, just kick back and enjoy a movie, or try to get some rest at some point! It’s really the consistency of Singapore’s product that’s so impressive. 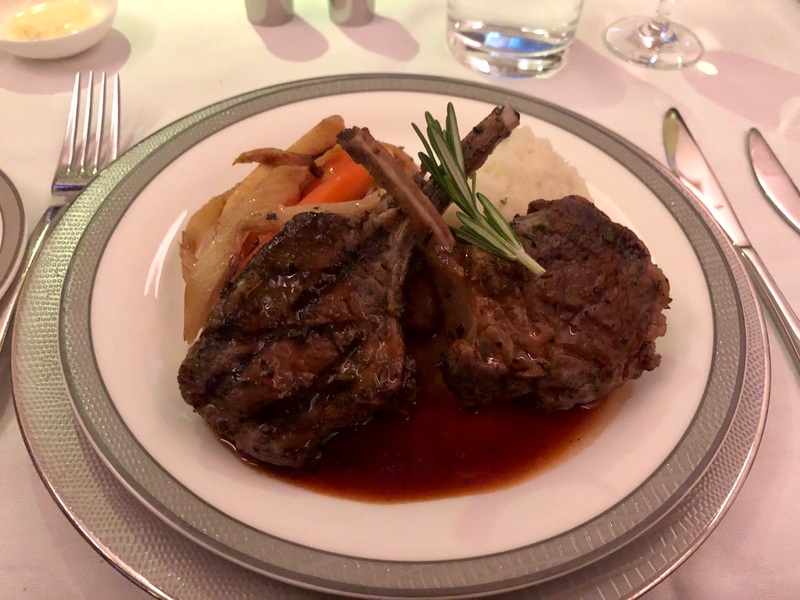 Yet again, the meal they served was delicious, and we both loved the Lobster Thermidor — it was just as good as the last couple of times I’ve had it! 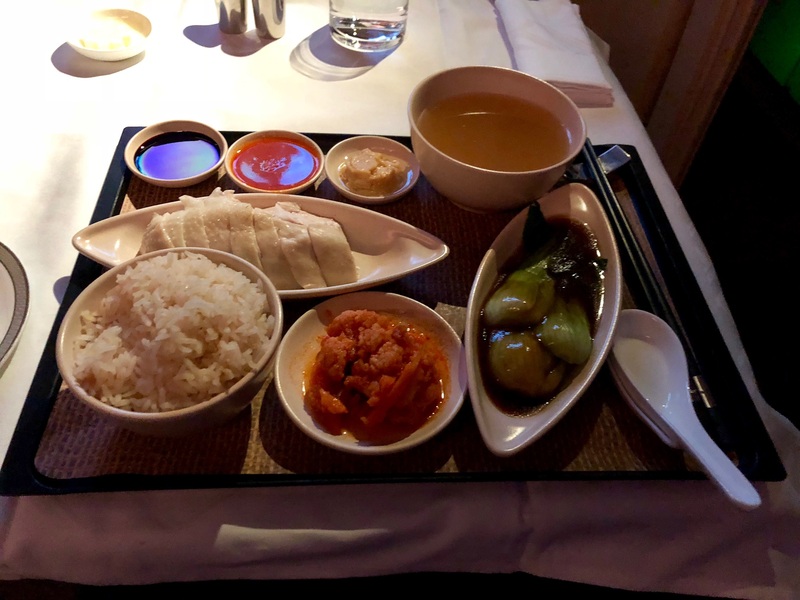 There are several airlines I can think of (such as British Airways) that struggle with delivering a consistent experience — but Singapore is not one of them. 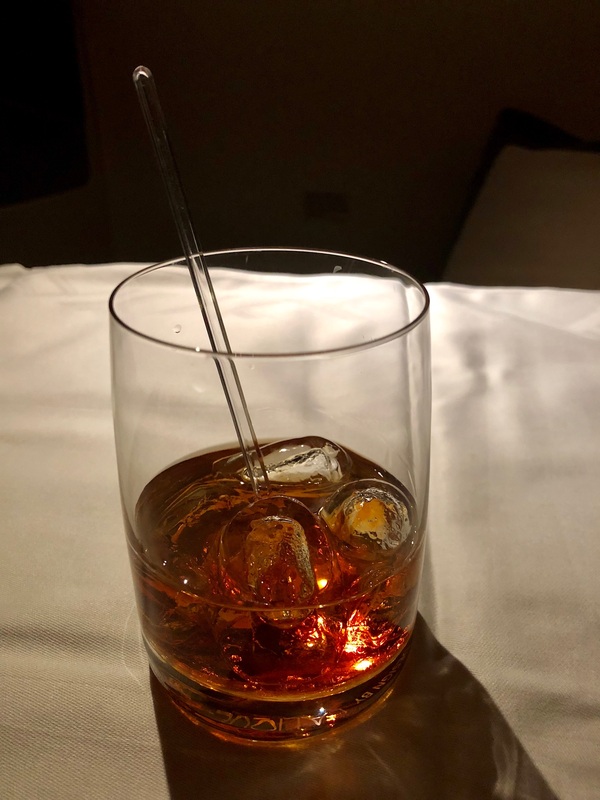 For some reason, I’ve developed a habit of drinking a glass or 2 of Cognac when winding down on a long flight…and for this trip I kept up the tradition! In Suites, the choice is Hennessy, which retails for several hundred dollars on the ground — a special treat! We both got several hours of sleep, as the beds are just so comfortable and luxurious by airplane standards. I don’t usually sleep well in general, let alone on planes, but this time I fell into a nice deep sleep! When we woke up several hours later, we asked for some breakfast. As you can see, I opted for scrambled eggs and chicken sausage, which was great and not too heavy. An hour or so after breakfast, we began our descent into Singapore, and before we knew it, we were walking off the plane saying a million “thank yous” to the outstanding cabin crew. They really couldn’t have looked after us better, and it’s certainly a flight that Quadey and I will remember for many, many years to come. 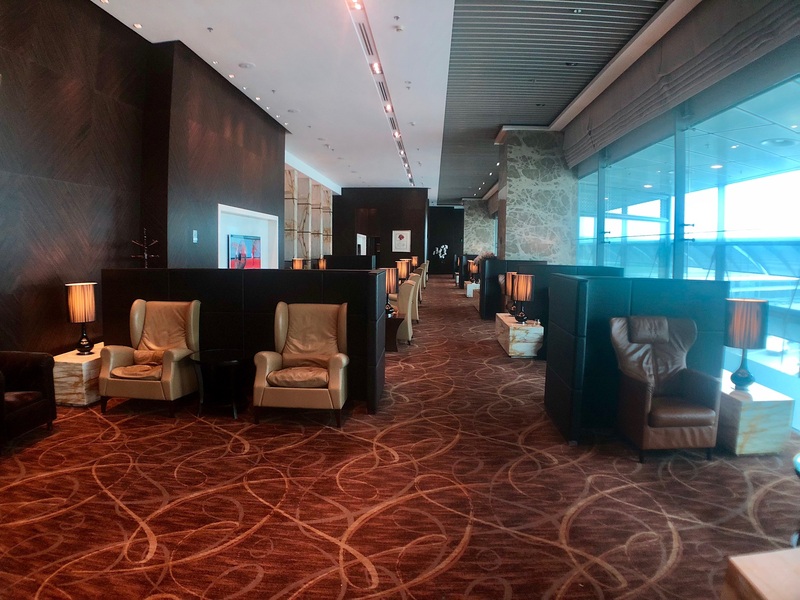 Upon landing, we immediately headed to “The Private Room,” which is situated in Terminal 3 at Changi (practically hidden inside the back of the SilverKris Lounge). It was only a 5-minute walk from our gate before going through customs to exit. 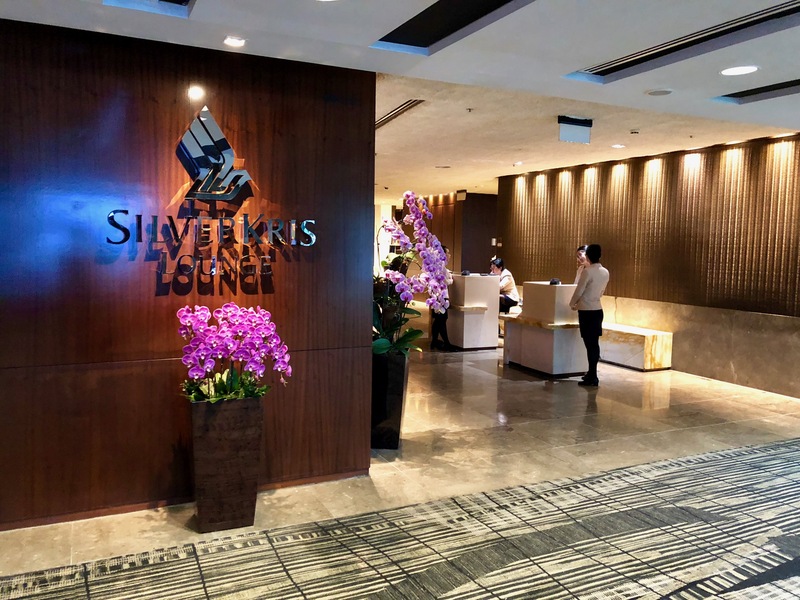 Upon approaching the entrance of the SilverKris Lounge, just present your first class ticket and/or your “Private Room” invitation, and you’ll be escorted past the business class lounge, then the first class lounge, and on back to the Private Room. Note: Only passengers who have a Singapore Airlines first class ticket (no partner tickets) will be invited to The Private Room. Otherwise, you’re not getting in I’m afraid! Here is the entrance to the SilverKris Lounge. 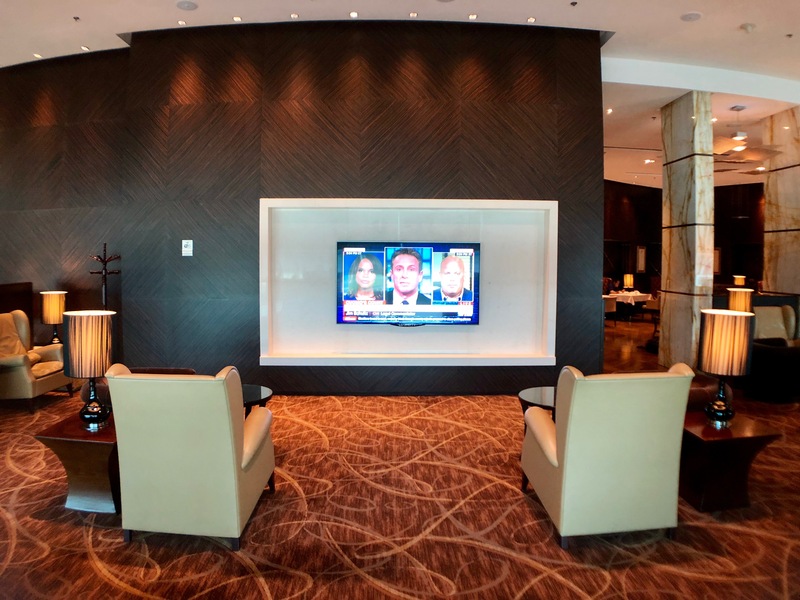 Within the lounge, you’ll be taken past the first class lounge and toward The Private Room! 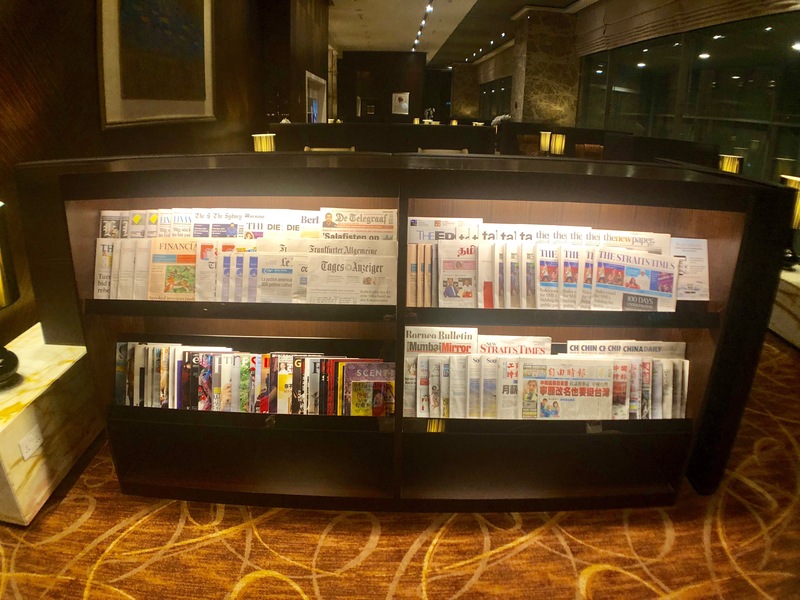 This is the entrance to The Private Room, where there is a selection of papers and magazines with a lot of luxurious seating areas behind them. When you’re being escorted in, you’ll be asked if you’d like something to eat, and then will be taken to the restaurant located at the back on the left side. 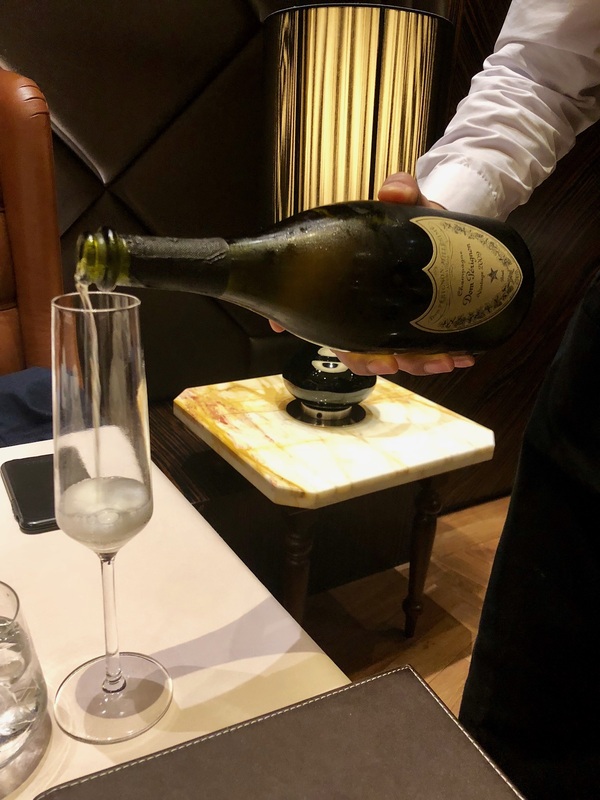 Of course, they serve Dom Perignon in the lounge and restaurant — it’s hard to say no when offered! 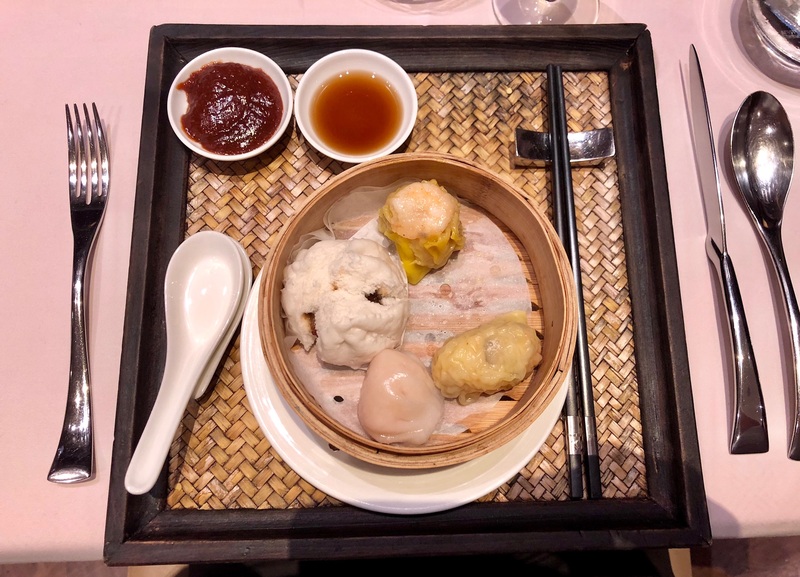 The “Dim Sum Delights” off the menu are amazing. You really must try them, even if you’re not generally a fan. They were so good that we ended up ordering a couple portions of these each! After The Private Room, it was about 10am, and we had a great opportunity to get some rest on our 10-hour layover. I had reserved a “day room” at the Crowne Plaza, which I’d certainly recommend to anyone in a similar situation. This allowed us both to catch up on some sleep and get ready for our flight to Sydney later that evening! After a good rest at the Crowne Plaza and a quick swim, we headed back over to The Private Room nice and early to make the most of this special benefit. 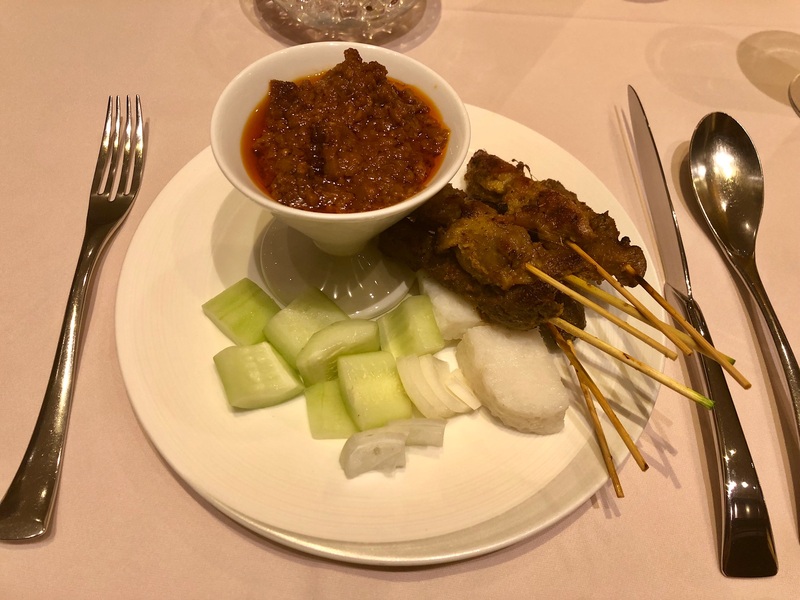 I ordered some Chicken Satay off the menu since it’s one of my favorite appetizers, and also had a soup — some of the best broth! After yet another fantastic experience in The Private Room, it was time to board our flight for the next leg of the journey! As this was my third Singapore Suites flight in about a day, I didn’t go crazy with lots of pictures for this one. 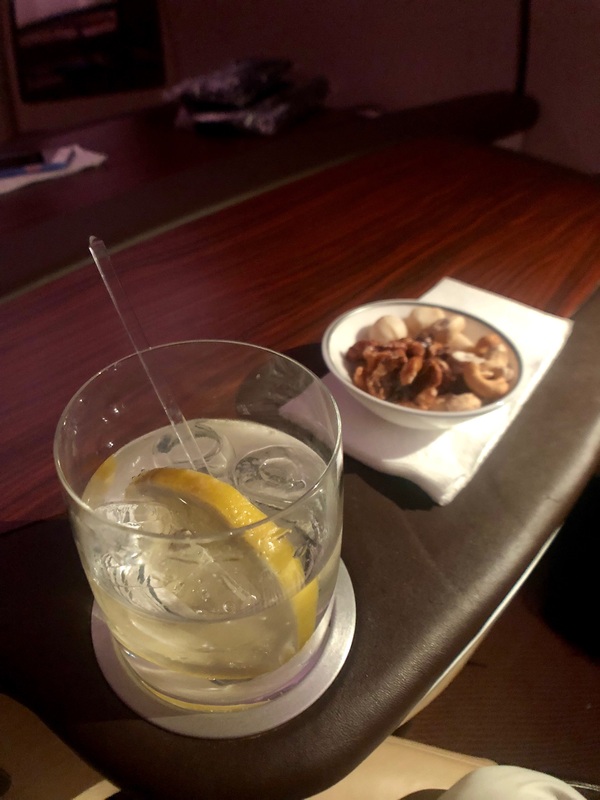 After a glass of Krug, we were served an assortment of warm mixed nuts and a good old G&T! At 7hrs 40mins, this is a comparatively short flight. Since we departed at about 10pm, we were soon ready for sleep after a delicious Chicken and Rice meal (which I had pre-ordered via “Book The Cook”). Quadey went for the Chicken Curry, which he said was excellent! Ahh yes. The beds were laid out for us with a “night nurse” (Hennessy of course) in hand and a movie. This is what it’s all about at 40,000 feet! Truth be told, I failed to get pictures of breakfast, but it was a fairly light order and a nice way to roll into mid-morning in Australia. We had finally made it to Sydney to see our friend Johnny and spend 5 days together catching up and messing about…just like back at university! This was an insane way to get from America to Sydney. 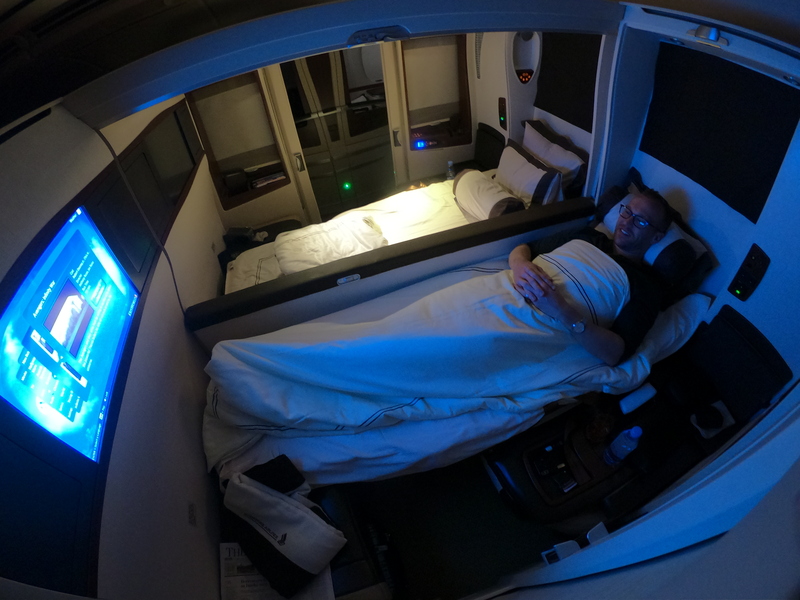 I purposefully chose a longer-than-typical route to maximize the redemption opportunity of flying Singapore Suites. As always, the Singapore Airlines crew were truly 5-star, and in my opinion arguably the best in the business. The food was phenomenal, there’s an over-the-top selection of Champagnes the entire time (Dom and Krug! ), and you can’t fault the spacious and comfortable seat (and lie-flat bed)! 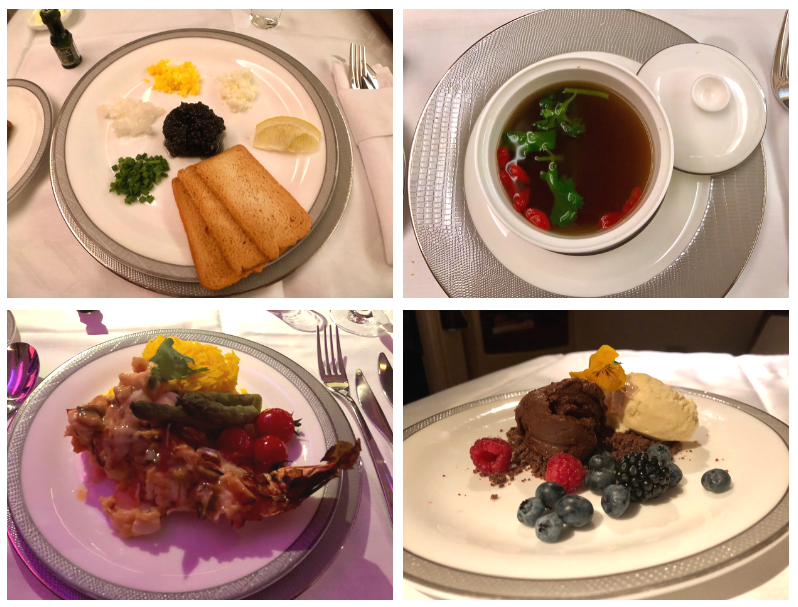 Singapore Suites…man, you’ve got to try it! The good thing is, you can transfer from any of the 4 flexible point systems (Chase, Amex, Citi, Marriott) to pull off this experience, and you really don’t need as many points as you might think. So book that trip, sit back, relax, and enjoy! 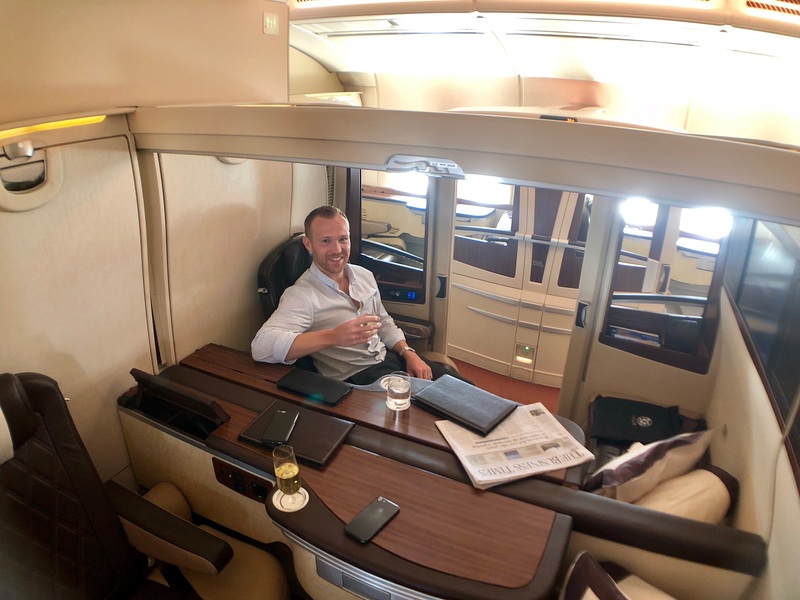 How do you earn enough points to fly Singapore Suites? 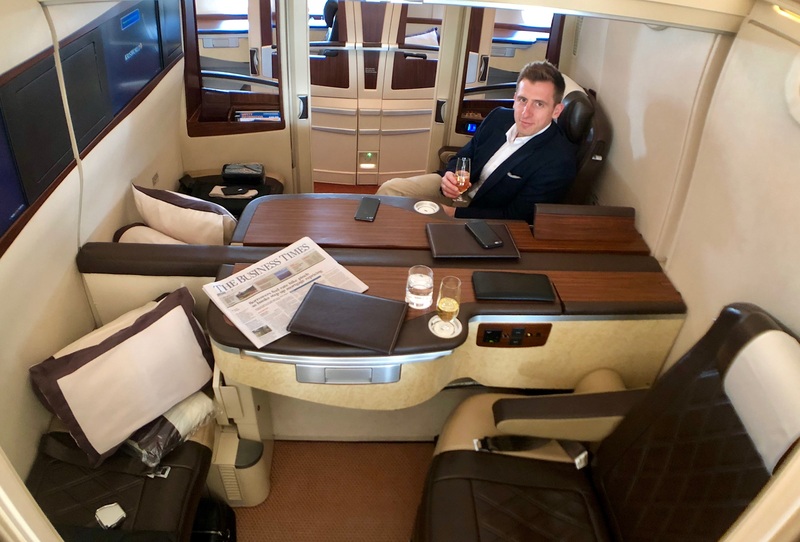 Singapore Airlines is a transfer partner of Chase Ultimate Rewards, Amex Membership Rewards, Marriott Points and Citi ThankYou Points. 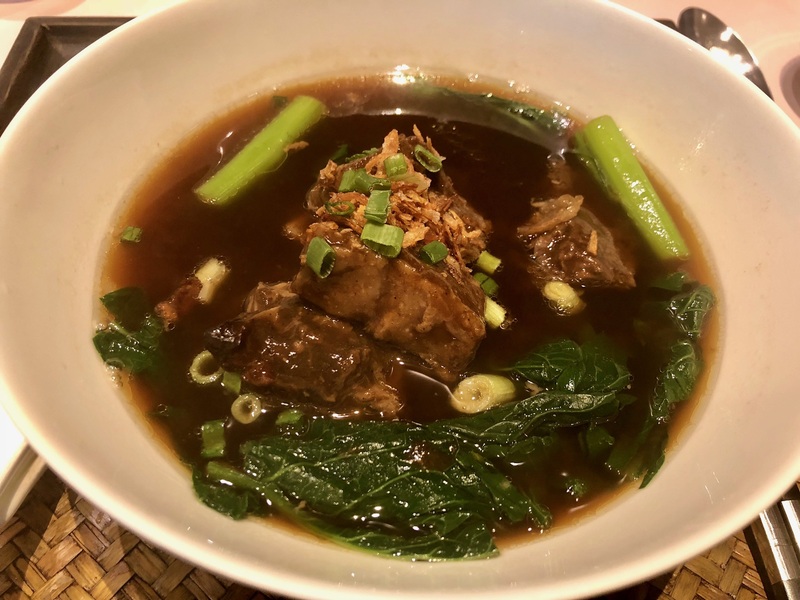 For this trip, I earned Chase Ultimate Rewards points by using their cards and transferred them to my Singapore KrisFlyer account to make the booking. 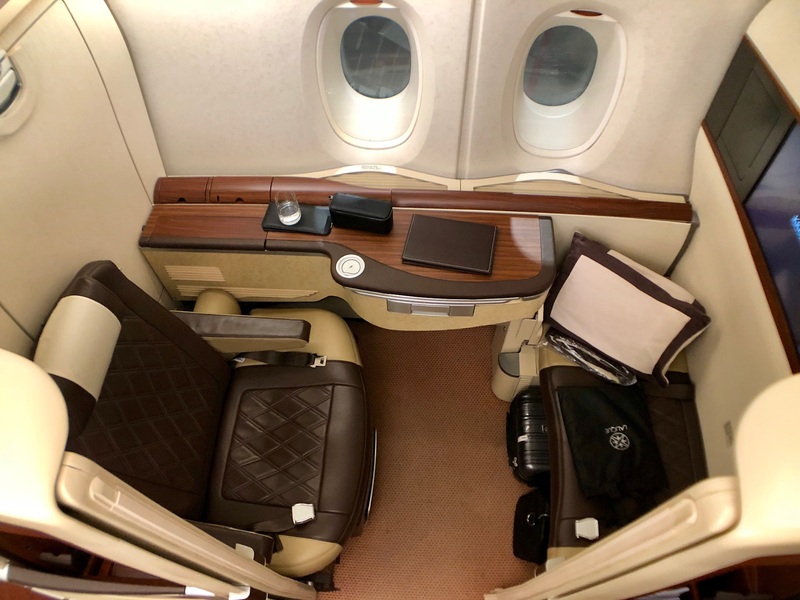 How far ahead is optimal to get first class award seats? I’ve checked for months at a time as far out as they allow, with zero success. Hi Christian – for maximum chances of booking these tickets, you want to look out as far in advance as possible which is basically ~11 months ahead. Looking for one person a few months ahead might be successful, but there’s practically no chance for two persons – you need to look a lot further ahead than that. Also, don’t rule out the “waiting list”. We’ve had multiple successes booking 1-2 tickets on a waitlist (ensuring it’s on quiet Tuesday or Weds for example) and they have cleared a few weeks after booking. They can also clear much closer to the day of departure which is obviously a bit nerve racking so you’ll always want to have a backup award seat in place, e.g. business class which is pretty wide open most of the time.